I am a Veterinary Care Assistant, helping to give the best care to your pets alongside the Veterinary nurses and Veterinary surgeons. 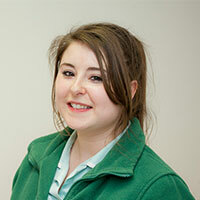 I want to go on to complete my Level 3 in Veterinary Nursing and become a fully qualified Royal Veterinary Nurse. I have worked at Mulberry Court for nearly 4 years now. I love going into work every day, not knowing what the day will bring. I love all animals but I especially have a love for Dachshunds! I hope to one day have one of my own. I have two guinea pigs who are sisters, their names are Honey and Rusty. I love them dearly, my little fur babies!